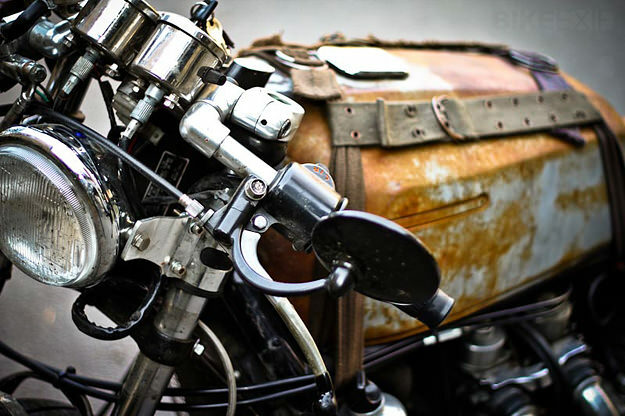 At face value, there’s nothing unusual about Paul Dutra’s taste in motorcycling. He owns a heavyweight tourer—a Goldwing, natch—and he likes to make a big trip every year. But Dutra’s steed is not a 900 lb road sofa with a sound system, sat-nav and heated seats. 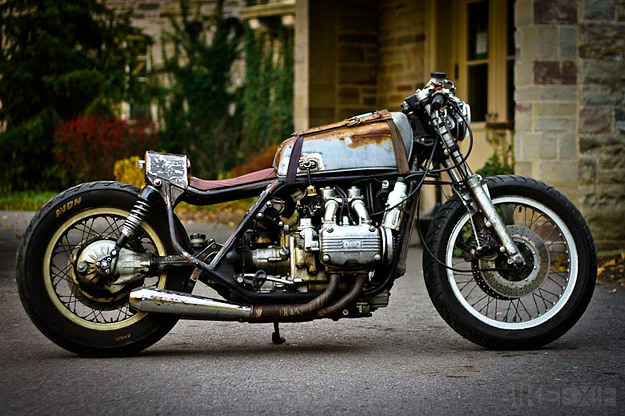 El Guapo (“The Handsome One”) is a rusty, stripped-down custom Goldwing with hand-beaten bodywork and not a pannier in sight. Dutra’s bike is a 1975 GL1000, with a flat-four 999 cc motor. 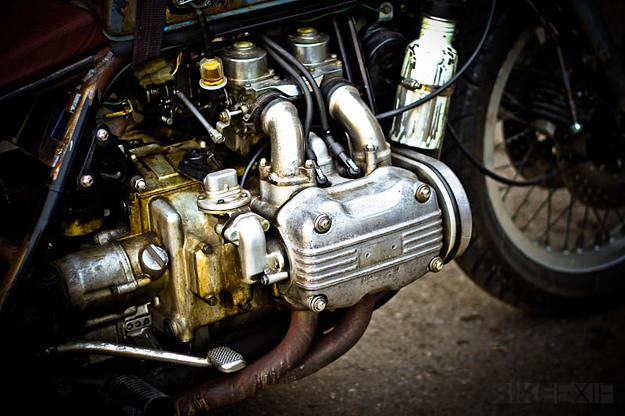 It had been faithful to its former owner for 35 years, and although it was time to move the bike on, the original owner didn’t want to see it scrapped. He wanted it to go to someone who could completely transform the machine, giving it a new and unexpected lease of life. 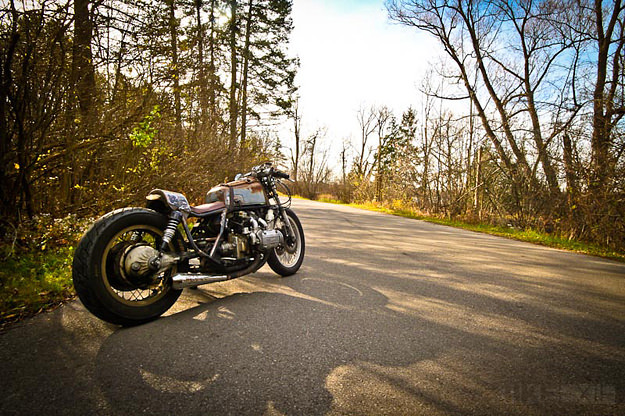 That person ended up being Paul Dutra of Back Alley Motorcycles in Ontario, Canada. Dutra put the Goldwing on the chopping block. With no budget for bling, he decided to turn it into a “Rat Café”. The first problem was the tank, which isn’t really a tank on a Wing: it’s an air box and glove box that leaves a gaping hole in the frame. The real tank is under the seat. “This made for a really interesting build, as there are no tanks on the planet that would fit the Wing frame … I was trying to get rid of the tank under the seat, because of the “Cafe Racer” look I was going for.” After fabricating a traditional backbone for the frame, the only thing that would fit was a rusty old tank from a KZ550. Dutra then chopped the rear frame and fitted different angles and bends until he had the right tail. 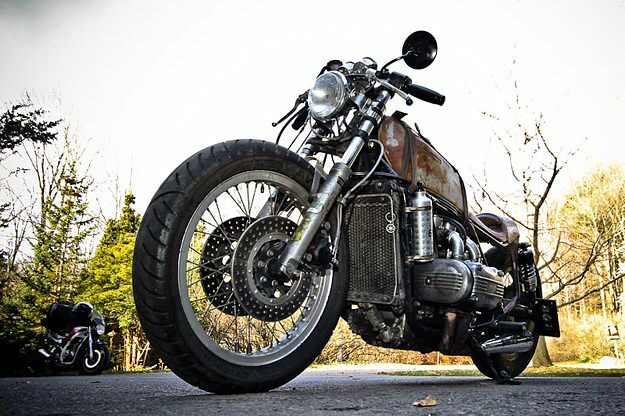 “I wanted to lower the bike, so I went with 11.5-inch shocks. That gave me the ride height I was looking for.” Dutra hammered and welded up a rear cowl out of 3/16” plate, lowered the forks through the trees, and mounted up Tomaselli clip-ons to the uppers. With help from a couple of friends—including Tim Aysan from Do The Ton—the wiring was finished and the bike was fired up for the first time. After some final adjustments to the shocks, Dutra took the Goldwing out for a shakedown ride. Then he immediately loaded up his backpack, and rode out to L.A.—a round trip of over 5,000 miles. He made it there and back in nine days.